Mrs Redman said the crash was "really scary"
A woman who cracked three ribs when a former Cabinet minister crashed his car into her cottage has spoken about the shock of being thrown around the room. It is believed Lord Walker, 75, was not badly hurt when his Jaguar X-Type smashed into the front room in Flyford Flavell, Worcestershire, on Thursday. Sheila Redman, who had been sitting down to have a coffee, said: "I just don't know how I got away with it." Firefighters said the 16th Century home was still safe to live in. 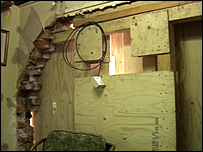 But it is believed the repair bill could be more than £20,000. Mrs Redman's husband, Reg, was out shopping when the incident happened involving the peer, who spent 31 years as Worcester MP. As well as the cracked ribs, she bruised her arms and legs and needed hospital treatment, but has been struggling for breath since. Mrs Redman said: "I was just peacefully reading the paper and bang. "I think the shock's coming out a little bit now. "It's not the fact that I hit the deck and got knocked about a bit. What's locked in my mind is this bang. "It was really scary (but) it's no good crying about it, is it? You've got to pick the bits up and keep going."